Steven (Chicagoland, United States) on 8 November 2018 in Plant & Nature and Portfolio. Known mostly for a thriving snow skiing resort, this view was taken at Chestnut Mountain Resort in Galena, Illinois near one of their ski slopes where you meet the Mississippi River at the bottom. This time of year, there were hardly any people staying at the lodge. Photo captured on October 15, 2018. Autumn is beautiful symphony of colors.. .
Très très jolie harmonie de couleurs nuancées sur la canopée. Magnifique paysage! D'automne ! J'aime Beaucoup ! absolutely lovely....nature's own tapestry work !!! It's a beautiful place with fresh air and wonderful view. A symphony of colors ! Very beautiful ! very nice color combination !! Magnifiques couleurs automnales ! Merci ! Quel ciel et vue quelle végétation en feu fantastique compo et vue superbe. Gorgeous and with great framing to sandwich the trees between grass and a very pretty sky. A lovely, elegant sky over the fine colors in the trees. A wonderful photo indeed. Perfect title. These trees in all their colors are beautiful. Wow! What stunning colours in these skies and forest. Simply beautiful. Nature never ceases to marvel. A gorgeous autumn scene. The trees are magnificent. I love the color in the sky! Beautiful colours and excellent textures. We were gobsmacked by this while in Michigan this past week, Steven. No wonder it's my favorite time of the year! Des couleurs fantastiques superbement mises en image! Very beautiful arrangement o colors. Winter resorts are usually very convinient out of season. gorgeous autumn colors and a beautiful colored sky... really a fabulous photo! Une palette qui ne peut que me ravir, superbe ! Ski slope? In Illinois? Well, who knew???? Not me!!! 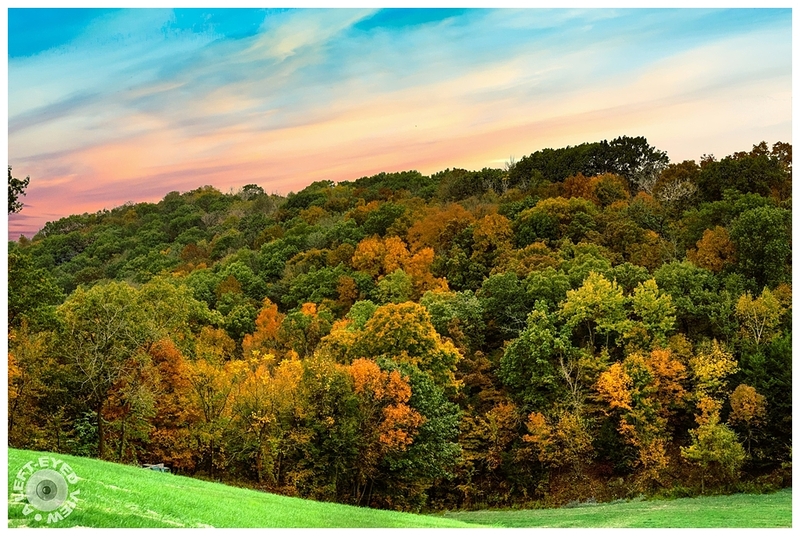 This is a gorgeous image - the Fall colors are beautifully presented, Steven! This beautiful hillside brings a feeling of nostalgia for western New York.